​As a graphic artist wanting to share my work while earning a bit of money to keep me going, getting my work on T-shirts, bags and banners seemed like an obvious first step. As my brand unexpectedly took off, I found myself increasingly drawn into the production side of the business, and the wonderful world of screen printing! 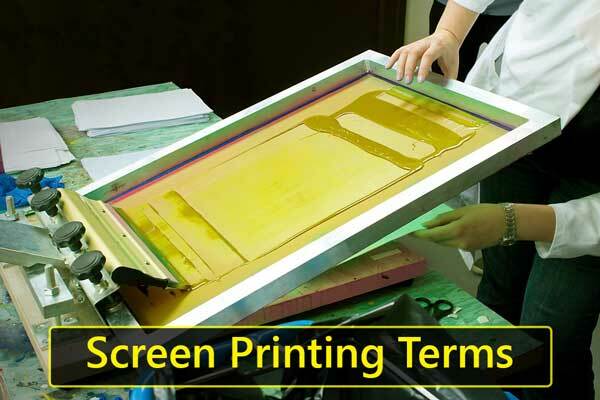 Screen printing is a method of printing where ink is pushed through a mesh stencil to transfer the design to the fabric. Using either cut-outs or impermeable material, the ink only transfers to the areas of the fabric that the screen permits. Just a single color can get to be applied at a time, and a new screen is required for each color. Starting there was quite a learning curve, especially when it came to understanding all the industry jargon. I have listed the most important screen printing terms I wish I had known when starting. When the ink printed on fabric is wearing off, usually due to rubbing or scraping. An electric or hydraulic screen press that allows for fast, high-quality production. Of course, it is quite a bit more expensive than a manual press. ​This oven is used to ‘cure’ the ink to set it to the fabric. It uses several infrared heat panels to heat the ink to 330 degrees Fahrenheit. When ink leaks outside the designated print area, or when two colors printed closely together mix into one another. Printing two or more inks at the same time to create a gradient effect. ​This is the process of exposing a prepared screen to light to harden the emulsion. Where the emulsion is exposed to light, it hardens, and this forms the part of the screen that will block the transfer of ink. Other parts of the screen will have been covered by a film that blocks the light, leaving the underlying emulsion soft so that it can be washed off the screen. This leaves a clear area in the mesh were ink can be pushed through, the stencil. Where two different printed colors come edge to edge (abut) but do not overlap. Standing for Cyan, Magenta, Yellow, and Key (Black), these four colors when combined can make almost any color. A full-color rendition of the artwork, exactly as it should appear on the fabric. Separation of the full artwork into different color layers for printing (as each color layer needs to be printed separately). The quality or amount of ink laid down on the fabric when the screen is printed. Ink that has been set and bonded to the fabric through heating, usually through the use of a belt oven. Ink that bleaches the original color out of the fabric to create a new color, leaving a softer feeling print. It only works on 100% cotton. When printed dots enlarge to greater than their desired size, usually due to a build-up of excessive ink, undermining the accuracy of the print. A photosensitive chemical, that can come as a liquid, roll or sheet, that is applied to a screen to make a stencil. In the final stencil where the emulsion is present, ink will not be able to pass through the screen onto the fabric, and where the emulsion is absent, the ink passes through. ​The process of printing the same ink twice, usually when printing a light color onto a dark-colored fabric. ​Spreading the ink over the screen and then pushing the ink through. When the artwork is done in such a way that there is a gap between two different printed colors. An image created using colored dots or various sizes and spacing. These are small dots to be seen by the human eye and appear to blend to create shades of color. ​Side of the screen where the ink is placed. The material that is stretched over the screen fame that allows ink to pass through. The size of the openings between the mesh filaments. Higher numbers have smaller openings and produce a softer feeling print, while smaller numbers have larger openings. ​Plastisol ink containing metallic particles for a metallic looking print finish. ​Printing one color on top of another. Ink that sits on top of the fabric, rather than soaking into it. Used for printing opaque graphics. Pantone Matching System, a method for matching colors. ​This is a frame (metal or wood) with a screen made of mesh tightly stretched over it. ​The alignment of one color of the artwork with another. Prints that appear to extend past the boundaries of the fabric. Screen used to print a particular color. ​Any color generated by ink that is printed using a single run. ​A flat, rubber-bladed tool used in pulling ink wholly and evenly across the screen while you print. ​The left portion of the screen that is uncovered with emulsion and allows ink to go through and transfer to the fabric underneath. ​The item that the ink is being printed onto. The side of the screen that comes into contact with the substrate is known as the substrate side. ​It is a technique in three-color printing where the bottom color bleeds out from under the overlaying inks. ​Printing a layer of white ink before printing other colors. This is usually done when printing on a dark color to maintain the color integrity of the inks. ​An ink that sets when exposed to UV light, rather than needing to be heated. ​A graphic produced using lines and points instead of pixels so that it can be stretched or shrunk to almost any size without undermining the integrity of the artwork. ​The thickness of the ink. Water Based Inks: Ink made up of water that dyes the fabric directly, becoming part of the fabric, instead of sitting right on top of the fabric like plastisol inks. With a grasp of the jargon, you’ll find that your conversations with screen printers run much more smoothly, and you’ll encounter fewer errors caused by simple misunderstanding.